Despite California's strictest gun control laws in the country, Gov. Jerry Brown signed 11 new gun control bills into law Friday, and vetoed seven. 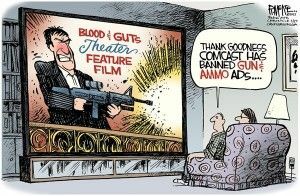 The gun control measures signed Friday include strict limits on magazine capacities, add more paperwork for law-abiding gun owners who wish to buy or sell a gun, establish stiffer penalties for law-abiding gun owners who store a gun in a home or storage facility where a child could have access to it, and add a new ban on lead ammunition used by hunters, so that it does not endanger animals. One of the most controversial bills, AB 711 by Assemblyman Anthony Rendon, D-Lakewood, will ban lead ammunition in hunting. Many believe this will kill the hunting industry in California. “Lead poses a danger to wildlife,” Brown said in his signing message. But then, technically, so does hunting. Animal rights groups, including the Humane Society, and Audubon California, led the crusade for California to be the first state in the nation to kill wild game hunting. Jennifer Fearing, the California senior state director of the Humane Society of the United States, apparently lobbied Gov. Brown on AB 711 at the dog park. 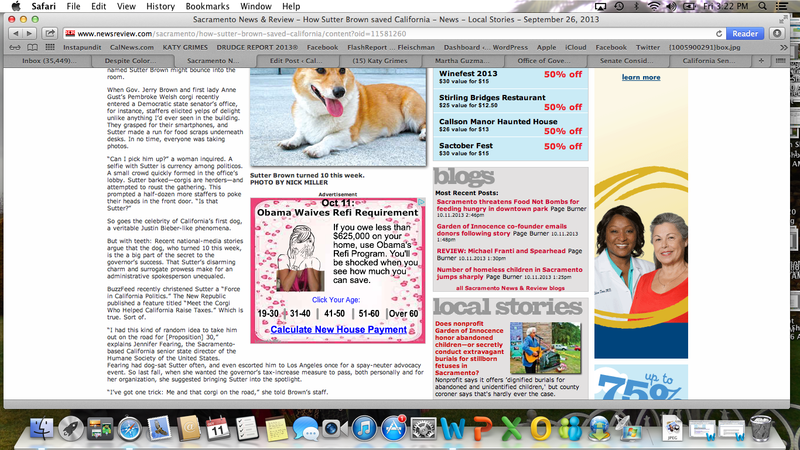 A recent story in the Sacramento News and Review told how Fearing dog-sits for Sutter Brown, Gov. 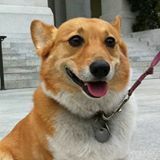 Jerry Brown's Pembroke Welsh corgi. While Gov. Brown was considering signing the most comprehensive ammo ban in the country, the Sacramento newspaper published the story about how the California Humane Society lobbyist dog-sits for Gov. Brown's dog. This could go a long way in explaining how the Humane Society has achieved favored environmental group status than any other environmental group in the last 3 years. 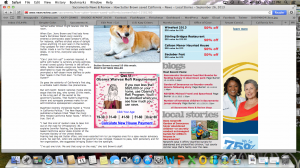 It makes sense — their California lobbyist is the free doggy daycare sitter, and former Prop. 30 publicist, using the governor's dog. But AB 711 was amended at the 11th hour in a secret deal to postpone the effective date until 2019. If, according to the Humane Society, the need for the bill is really over concerns about poisoned Condors, what about the thousands of great birds which will have died by the time the bill finally goes into effect six years from now? Alas, Brown signed the bill. Perhaps we should blame Sutter Brown. Brown vetoed SB 374, by Senate President Pro Tem Darrell Steinberg, D-Sacramento, which would have expanded the definition of “assault weapons” to ban the future transfer of all semi-automatic rifles that accept detachable magazines. SB374 would have required new “assault weapon” registration, and the registration of all those semi-auto rifles currently possessed, in order to retain legal possession in the future; and subjects these firearms to all other “assault weapon” restrictions. Steinberg claimed the bill would have closed a “loophole” in California's assault weapons ban by preventing rapid reloading using replaceable magazines. “This bill goes much farther than banning any semi-automatic rifle with a detachable magazine,” Brown said in his veto. Brown said he vetoed SB 374 because the bill covered many rifles used in hunting, as well as collectible guns. And, hundreds of thousands of gun owners would have to register their weapons as assault rifles in California, if SB 374 had been signed into law. But Brown disagreed. “I don't think this bill's blanket ban on semi-automatic rifles would reduce criminal activity, or enhance public safety enough to warrant this infringement on gun owner's rights,” Brown said in his veto. SB 683 by Senator Marty Block (D-San Diego) – Firearms: firearm safety certificate. SB 363 by Senator Roderick D. Wright (D-Los Angeles) – Firearms: criminal storage: unsafe handguns: fees. SB 127 by Senator Ted Gaines (R-Rocklin) – Firearms: mentally disordered persons. AB 1131 by Assemblymember Nancy Skinner (D-Berkeley) – Firearms. AB 48 by Assemblymember Nancy Skinner (D-Berkeley) – Firearms: large-capacity magazines. AB 170 by Assemblymember Steven Bradford (D-Gardena) – Assault weapons and .50 BMG rifles. AB 231 by Assemblymember Philip Y. Ting (D-San Francisco) – Firearms: criminal storage. AB 500 by Assemblymember Tom Ammiano (D-San Francisco) – Firearms. AB 538 by Assemblymember Richard Pan (D-Sacramento) – Firearms. AB 539 by Assemblymember Richard Pan (D-Sacramento) – Firearm possession: prohibitions: transfer to licensed dealer. AB 711 by Assemblymember Anthony Rendon (D-Lakewood) – Hunting: nonlead ammunition. A signing message can be found here. AB 169 by Assemblymember Roger Dickinson (D-Sacramento) – Unsafe handguns. A veto message can be found here. AB 180 by Assemblymember Rob Bonta (D-Alameda) – Registration and licensing of firearms: City of Oakland. A veto message can be found here. SB 374 by Senator Darrell Steinberg (D-Sacramento) – Firearms: assault weapons. A veto message can be found here. SB 475 by Senator Mark Leno (D-San Francisco) – Agricultural District 1-A: firearm sales at the Cow Palace. A veto message can be found here. SB 567 by Senator Hannah-Beth Jackson (D-Santa Barbara) – Firearms: shotguns. A veto message can be found here. SB 755 by Senator Lois Wolk (D-Davis) – Firearms: prohibited persons. A veto message can be found here.